Roger was born in Hollidaysburg, in south central Pennsylvania where the Appalachian Mountains cross into Maryland, Virginia, West Virginia, Ohio and into the deep south. His ancestral family settled and farmed in the fertile valleys of this region after emigrating from Ireland before the War of Independence in the 18th century. Like so many Appalachians he left the region to find opportunities, training and work in large metropolitan centers around the United States. Nevertheless, his heart is always in the Alleghenies and he still calls Appalachia home. The thing that links people like him is their heartfelt desire to return to the place of their birth - Appalachia. It was in the rolling hills surrounding Hollidaysburg, that Roger absorbed the beauty of the surrounding landscape. His childhood was spent playing in streams, creeks, woods, and meadows. When he was not rambling through fields of wildflowers in search of natural wonders, he was drawing and coloring on paper. (The family moved to Philadelphia for better opportunities. It was in the Philly region that Roger was introduced to talented teachers and other artists.) Roger's passion for image creating was as great as his love for nature. 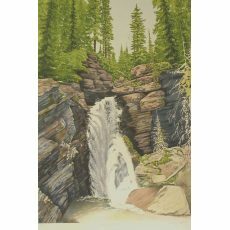 After professional training and several academic certificates in art,(B.F.A., M.Ed., M.F.A) he combined his interests in hiking and camping with drawing and painting. Today, Roger presents his unique vision in graphite, watercolors, acrylics, oil paintings and sculpture. You may email the artist through this web site. Like his Pioneering ancestors, Roger was always looking for greener pastures and not usually content in one place for very long. Roger traveled throughout the United States looking, seeing, listening, perceiving and absorbing the American landscape. He settled in Idaho for three and a half years to study and experience the expansive beauty of the western U.S. 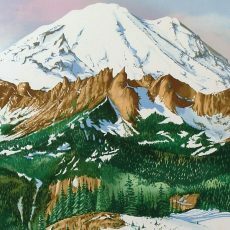 While working on his Master of Fine Arts Degree at the University of Idaho in Moscow, Idaho he visited sites in Wyoming, Colorado, Montana, Washington, Oregon, California, Alaska, and Western Canada where he completed many paintings of this magnificent and diverse country. After earning the Master of Fine Arts in painting, Roger returned east and worked as an artist living in Manhattan and experiencing the fast paced life of an artist in the Big Apple. What a contrast between the vast open country of the west and the crowded iron and steel avenues of the city! While living in New York City he volunteered his free time and joined a choir and played guitar and sang Liturgical Folk Music at Saint Francis of Assisi Roman Catholic Church on West 34th Street. Furthermore, Saturday mornings found him making breakfast and serving the homeless at the Catholic Worker Shelter/Soup Kitchen on 36 E. First Street founded by Dorothy Day and Peter Maurin. Inspired to help humanity and make a positive contribution to the world, he joined Maryknoll (The Catholic Foreign Mission Society of America) as a Lay Missioner. He worked with Rev. Les Blowers, M.M., and the Parish Council (1983-1986) as a missioner/artist at The Word of God Parish, Bupyoung 5 Dong, Inchon, South Korea where his response to the needs of the parish included designing the interior of a new church in the magical seaport town of ancient Inchon. Roger sculpted the 14 Stations of the Cross, the Main Crucifix, Paschal Candle Stand and other Sacred Objects. He explored the magnificent mountains and fertile valleys of the Korean Peninsula with new friends he made among the gregarious Korean people. His sketchbook filled quickly with drawings and watercolor paintings of the beautiful people and wonderful places he discovered. Additionally, Roger's interest in teaching has roots in his High School and Bucks County Community College days. Fred Slopey (High School Art Teacher) and Bill Bagley (Friend from BCCC) inspired and encouraged Roger to pursue art/education. He earned the Master of Education Degree from Temple University in Philadelphia, Pennsylvania and taught high school (1972-1974) and college art (1987-2005). For several years he was Artist/Educator and taught painting and drawing at the Graterford Prison in Graterford, Pennsylvania. Roger became Art Director of the Cummings Art Gallery, Mercyhurst College, Erie, PA and the Multiple Choice Gallery, Montgomery County Community College, Bluebell, PA (1987-1998). While living and working in New York State, Roger taught computer graphics courses at SUNY/Westchester Community College, Artist Workshops in Peekskill, NY (2001-2005). One of Roger's accomplishments was the successful organization of a Part-Time Faculty Union at Montgomery County Community College, Blue Bell, Pennsylvania. The Union brought fare wages, benefits, representation, and the power of collective bargaining to more than 150 dedicated and hard working adjunct teachers.He served as Second Vice-President (AFT-AFL-CIO Local No. 4272) of the Union from 1998-2001. Toward the end of 2005, Roger moved to the Historic Delaware River town of Bristol, Pennsylvania. He is currently working in Trenton for the New Jersey Department of Environmental Protection/Historic Preservation Office as a Graphic Artist. Many hobbies occupy much of Roger's time. He loves to explore the great outdoors through respectful and insightful activities such as canoeing/kayaking, fishing, camping, hiking and photographing our planet's natural beauty. After completing 32 years in active music ministry, Roger is currently enjoying semi-retirement from full time ministry. He makes guest appearances and helps out when a local band needs assistance at a prayer service or sacred liturgy. He loves to make beautiful music for The LORD. 2006-08 Roger volunteered at Catholic Social Services where he tutored Liberian Refugee teens at the after school program in Levittown, PA.
Over the years Roger has maintained his interest in water safety, especially now that Kayak/Canoe activity has increased on the waterways lately. He first became interested in Water Safety when, (age 17) as a Life Guard, Roger worked at Brookside Swim Club in Yardley, PA. He now turns his attention to Gaurding Lives on the Upper Delaware Scenic River and Recreation area and volunteers as a member of the National Canoe Safety Patrol and with the National Park Service, (Ranger Station at Zane Gray Historic Park) in Lackawaxen, PA. Safety First! Always wear a Life Jacket when in a boat! Have fun and be safe. Moreover, He is a member of the artists group in Bristol, PA - THE ARTISTS OF BRISTOL ON THE DELAWARE. They meet monthly to form a community of like-minded creative people in the area. This is the first time in Bristol's 325-year history that this has become a reality.